This panna cotta is made with vegan chocolate and vegan gelatine. Topped with (wild) strawberries and blueberries, it makes a happy and healthy dessert! Heat the almond milk, soja cream and vegan white chocolate in a saucepan until the chocolate has melted. When cool, add the vegetarian and vegan gelatine powder and stir well (I sometimes use a blender to properly mix it) until the gelatine has dissolved. Leave to cool for a couple of minutes, before adding the chocolate vermicelli. For a marbled effect, stir in the chocolate vermicelli just slightly. Pour into dessert glasses and refrigerate for a couple of hours. 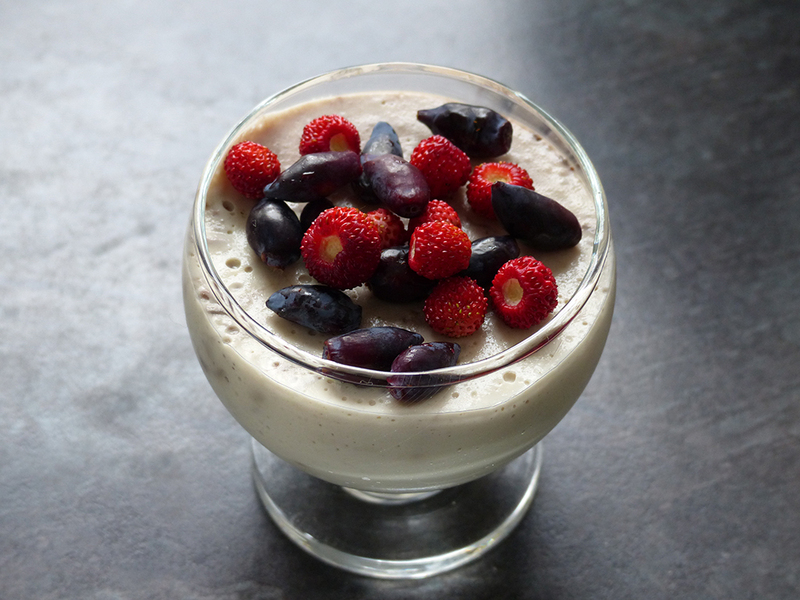 Top with seasonal (wild) strawberries and blueberries (or honeyberries). honeyberries are edible honeysuckle berries and are the first berries to ripen. They grow really well in Scotland and it's worth to have one or two bushes in your garden. They taste just like blueberries. Just make sure the label says 'edible' in the garden centre!